What the heck is a kumquat? Poppy- you aren't one, okay? You are just the size of one. Poppy is about an inch long from head to rump, and has finished the most critical time of development. Some vital organs — including kidneys, intestines, brain, and liver are in place and starting to function. Also, the arms and legs can bend now, and the hands are curled up over the chest. Cute! Poppy's tiny fingernails are starting to grow too! Watch out-- those things get sharp, as I recently discovered! I have been feeling really great this week! Again, the only indication of pregnancy is my constant fatigue. I just get tired so fast! I have slowly been unpacking and settling into our new home at Gary's. I want to create a nice, comfy home for my family, so I have been working for hours everyday getting things put away. All that organizing robs me of precious energy too! Well, you look fabulous, lady. 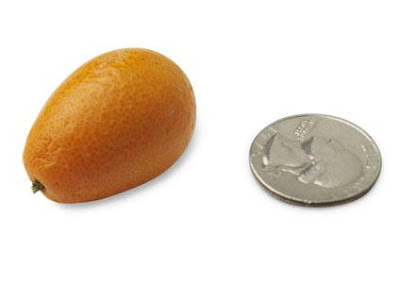 Also, I didn't know what a Kumquat looked like...thanks!